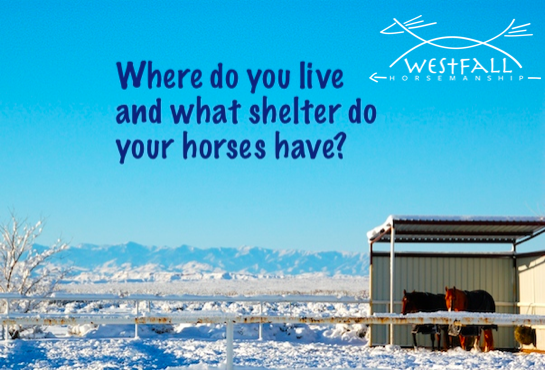 Where do you live and what shelter do your horses have? I am a fan of horses spending as much time out as possible. I love the idea of horses being out 24/7….but in many of the places I visit the weather also plays a part in this decision. When I lived in Ohio we had run in sheds that had gravel and small paddocks. If the weather was bad, freezing rain for example, we would put rain sheet or rain blankets on them. Still there were times that I would bring them in. Slippery ice or ground frozen with hoof-pot-holes or excessive cold with wind were times that I would bring them in. I always liked having stalls available if the weather was bad. The horses always seemed to appreciate the chance to be sheltered from the elements. They also enjoyed the chance to run and play in the indoor because even though they were outside the footing wasn’t good for running and playing. Some areas of the country are different. I just rode for hours in New Mexico in several inches of snow with no risk of mud or ice. It was also noticeably nice when we were in the ravines where the wind blew over but the sun shone down to warm us. I have been on ranches where the horses were expected to find shelter themselves; among trees, along ravines, etc. I haven’t personally done this but there are areas in the country where I have heard it is possible. What part of the country do you live in? What weather issues do you have; freezing temperatures, wind, mud, hail, ice, heat, snow? What type of shelter do your horses have access to; run in shed, trees, stalls, etc? ← How long do you think a horse remembers a person? live in upstate ny my horses stay out 24/7 no problems only have blanket on them..
We live in the mountains of western NC and it gets downright frigid at times. I never blanket my horses and we do have a stall for each one with an attached paddock. That way they have the option of coming in out of the wind. On really cold windy nights, I shut their top stall doors as well so there is no cross ventilation. Their paddocks are gravel with a layer of mulch on top. We do have to renew it as the weather warrants. We live in Iowa close to Omaha, NE. Our five mares have a 72 ft lean to on the south side of our barn. It is 10 ft wide. If the weather is stormy they are able to get inside the barn in a round pen or put into stalls. They almost always have the freedom to be in or out. We also have two smaller runs with separate lean to’s and stalls. I live in Eastern Ontario and my horses are currently on 15-20 acres with a shed large enough for all 6 of them to hang out it. In the snow and freezing rain we got this weekend, they chose to stand under trees with their butts to the wind. They spend all summer in the same barn so I know it wasn’t a space issue. They are all heavy coated. (including windchill and humidx) However where we live right now we are kind of in a ‘hole’ where there are mountains on either side of us, and trees all around. Most of the time the winds pass right over our heads. At the moment I have only run-in sheds, and I use blankets on my more chilly horses. However we have a Canadian and a Canadian cross who need no blankets as they where bred for this climate. The cross will get a rainsheet in extreme conditions but that all she needs. I think I would benefit from stalls though, as blanketing can be tricky when it comes to picky the right one. I live in Colorado. We have large pens where the smallest one is about 20×20 feet. They all have a run-in shelter. Out at our barn there are no indoor stalls. We blanket the horses if it gets too crazy cold. Just last week we didn’t get much above 10 degrees. There were a few horses that didn’t have blankest but have extremely huge winter coats. Here in Colorado the weather can go form 13 one day to 70 the next (that really did happen once). I love having the horses in big pens with a shelter. I just don’t really like indoor stalls very much also the horses love the open space. Piedmont NC. The temps are usually moderate and wet. The 2 older QH’s (ages 23 & 24) are out 24/7 with access to a run in and cedar trees trimmed up longer on the north side, so they can get under them. They are not blanketed. Their coats are thick. The APHA gelding is stalled at night because he prefers it. He likes to lay down to sleep. He is usually put up around midnight and turned out around 8am, to limit the stall time. All have high quality hay several times daily, weighed to provide the proper amount for their size, but not free choice. They would be too fat if allowed free choice. I have had the QH’s since age 3 &4 and the paint since 5 months (now 8yrs) and I have only had one instance of a virus that required a round of antibiotics for the 23yr old gelding and no injuries requiring vet attendance. They are allowed to be horses, but are checked at least twice daily. They know when they need something and I pay attention to their signals. I manage a boarding barn in Northern IL. The winters here are unpredictable, the low for tonight is -14. Our barn has 150 stalls on only 9 acres. We are very rarely at capacity but are pretty close to it at the moment (136). The horses are stalled, with daily turnout. All meals are fed in their stalls. Turnout is in individual paddocks unless you & friends request that your horses be buddied-up. Blanketing is to the owner’s preference, some are allowed to get full winter coats & some of the AQHA pleasure horses have 2 blankets, a sheet, a sleazy & a hood in order to keep their show coats. I’ve very rarely seen a horse that came into the barn as an “outside” horse have a lot of trouble adjusting to being stalled. We have one Percheron mare who spends about 2 hours outside then creates an almighty racket until I go fetch her. Or she’ll come right through the gate & let herself in. That all being said, if I did it my own way I’d like them out 24-7 in small herds. It’s better for their joints & for their minds. I’ve got a 22 year old mare that I just retired up to MI where it’s much colder & snowier & she’s adjusted to outside life very well. She has a run-in (which she never uses) & in extreme weather, the pasture horses spend the night in the Indoor arena. We live in North Dakota and often have some pretty cold winters! 🙂 Our small herd is outside pretty much 24/7. Right now it is -8 and wind chills in -20’s. (Yuck! Its not always this bad!!!) However, it is sunny and the horses are choosing to be outside. They have shelter of the barn on 3 sides to break the wind, and we also have evergreen trees surrounding us that break the wind. However, if it gets really nasty, blizzard like or freezing wet rain, we do have stalls we can put them in. They tend to not like their stall time as much overall and want to get back out as soon as possible. Our horses always have hay available 24/7 in the winter to much on and stoke that internal fire, along with good water. They grow good full coats. It was interesting to note that the fatter horses had the shorter coats, while the thinner horse has the thickest coat. So far, this has worked for us! Thanks for the blog. I really enjoy it! My three horses have a run in that is two sided. They are blocked from the north wind and the west. In the summer having the west side blocked us nice because we are here in Texas and the western sun can be extremely hot! I too like my horses to have as much time out as possible. I live in Rockwall Texas. The weather can change on a dime here. We go from 50 degrees to 20 degrees in the matter of hours with a wind chill of 10 to 15 degrees in the winter. I have stall runs for my horses. So when they are up they have enough room to move around. Weather permitting, which means its above 20 degrees, no rain then they are turned out during the day and up at night. If its in the 40s at night or higher and no rain then they are fed and turned back out at night. I keep roundbales out so they have something to munch on and a soft place to lay down. I unfortunately do not have any shelter in the pastures so I constantly watch the weather year round. We are in Northern Michigan, about 45 mins from the Macinaw bridge. It’s cold here. ;o) We have 4 horses, and moved to this property almost 2 years ago, and it’s needed LOTS of work to make it habitable for us. There is no barn for the horses, but when we fenced pastures we included groups of trees, mostly pines, and also have them in groups in several areas just outside the fence. We also ran the fencing around some of the small outbuildings to provide windbreaks. Our property is big enough that we do our own hay and we put up mostly round bales with some square bales, which we’re lucky to store in a neighbor’s barn. The horse’s ALWAYS have a round bale, salt and fresh water in front of them. We don’t feed concentrates, but our ‘kids” are doing great. Fat and happy! I live in North Bruce Peninsula, Ontario…..I have 12×16 run in shelter as I am not allowed to build a barn on my property due that they didnt want “too many small farm” whatever it means. My Clyde/TB cross hate stall and love being outside all the time but my rescued TB mare is more challenge for me as she tend to shivering in cold weathers. I put blankets (rain sheet, turn out blanket and winter blanket, depends on the weather) But I had been trying to let her coat grow more winter coat so now she is only using the rain sheet 🙂 The front paddock is terrible with all the hoof potholes but good thing there is a back field that dont get mess up much. After the nasty weather overnight, they would get the warm beet pulp for breakfast and they love it! This is such a good article, and it appears most of us are on the same page, let them be horses as much as possible. I have a barn and stalls, which I use sparely now. I open my barn and stalls up, there’s bedding in the stalls, and they can go in and out at will. My old gelding is a little greedy and will keep my little mare outside under the awning. In the summer they both go in all day to get out of the heat and flies. On those really dirty nights, I put them in and they usually want in. I also make use of rain sheets for extreme wind and rain. Today we’re in the midst of freezing rain and it’s really ugly out there. I have them snug in the barn, and will put rain sheets on them later. Today it’s all about the footing. Freezing rain in Ontario! I live in northern Michigan and have all the weather you listed in one day!! Last week I had a dandelion popping up in the pasture and today we are under a winter storm watch. I currently have 5 horses and 2 ponies on my property. We have the ponies in a separate area with their own run in shed (known as the love shack) and a wind break. The amount of hair on the ponies is extreme. They for sure do not feel the cold. 3 of my horses wear blankets. One is old and the other two are slackers in the winter coat department. I own an obscene number of blankets. One for every horse and every weather situation. I told my husband it would have been cheaper to build me a big barn than for me to buy all the blankets 😉 I have 2 12×12 stalls. The old mare lives in one at night due to needing large amounts of senior feed that she eats very slowly. That leaves one stall open, and two large wind block walls to hunker down behind. In my observations, the horses will stay out as long as they can get out of the wind. I also wonder if them staying out has anything with how they were raised. 3 of my horses came from the Hermanson Kist horse auction in North Dakota (homeschool road trip) and they are very hardy. One of the ponies is such a princess and loves the love shack I wonder if she spent her early years stalled. With all that said we look forward to seeing you at the MSU stallion expo in March. Whatever the weather will be! I am from Germany, NorthSea Area. We have a lot of wind, storms and rain. I live on a farm, where we had stalls for the horses since I was a child. I change the farm into a Paddock Paradise after I read Jaime Jacksons book. The horses have a run in shelter on the trail and a lot of 200 year old huge oaktrees and also a run in barn. Every horse in the band has about 800m² space but they love to be with each other, eating hey, walking to the water, or just doing nothing together. I see a lot of happy horses-no more cages. I’m a French city slicker, leaving about 40 minutes from Paris, in a suburban area. My horses are boarded in a nearby “farm”, in a slightly more rural area, but still they are very short on pasture space. As a consequence, in the winter time, though it’s very mild and just yet, but very little freezing, my horse spends about 23 hours a day locked up in a stall, goes out maybe one hour, most generally in an outdoor arena, and sometimes a small outdoor pen, and it drives me mental to think about it. The worse part with stalled horses is they are like kids eating at Mc Donald’s every day, it kills their health but they love it ! He actually is barn sour, can you believe it…. I hate the situation, which hopefully will change when we get to move out of the suburbs, to a more rural area, within 6 months; Then I’ll make it a priority that they live outdoor, with a run in pen. Southern South Dakota–right now we are in an arctic blast of cold, well below zero and high winds. only the 2 yearlings have a large shared stall. 2 other horses have a windbreak of steel, just a wall, and another 5 have brush. I have personally stood with them to test how it feels. the lay of our land is such that its higher on the top/north end, and slopes downwards/to the south. so the wind goes right over them, and they are just fine. i have only needed to blanket one who wasn’t well off body wise, and only occasionally. Greetings from Austria (Europe). We have all 4 seasons with rain, hot summer days und frost and snow in winter. I have 4 horses and they are out 24/7 from April to October. They have 2 run-in-stables with automatic heated water and where they are feed. In winter time they come in at night. Our horses can decide if they would like to stand in the rain, wind etc. but just 1 does – the others stand inside and look outside and wait until the weather gets better. South Dakota: -35 wind chills tonight. Ours have a lean to on the barn, open to the east. They only seek shelter when it’s windy, no matter the season. I live in the Highveld in South Africa. We have a temperate climate; dry winters with frost but no snow, and hot, sunny summers with thunderstorms and sometimes hail. My horses really appreciate their field shelters in summer for shade and shelter from rain and hail. In winter, unless we have a freak rainstorm, they don’t use them at all. I only blanket clipped horses or those that spent the previous winter indoors.